These deluxe spy sunglasses look good as well as let you see what's behind you. The back of the lens is mirrored to give you a rear view scenario. 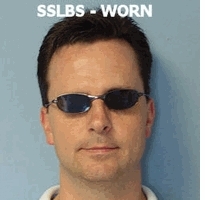 These Top Secret brand spy sunglasses are great for tracking or anti-tracking operations. They also are good sunglasses and filter out UV rays. All the spy sunglasses on this page have quality metal frames. Blocks 100% of harmful UV to protect your eyes. Also great for bike riding so you can see traffic or your partner without turning or attaching stuff to your handlebars. Two styles available, Aviator #SG1 and Current #SSLBS. The first picture is the aviator and the second picture shows the Current Style being worn.